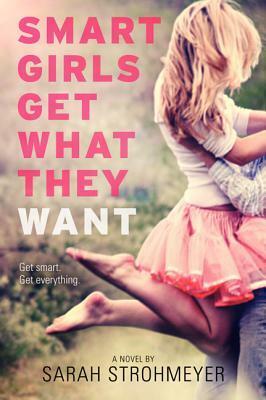 Smart Girls Get What They Want by Sarah Strohmeyer ~ Love.Life.Read. Gigi, Bea, and Neerja are best friends and total overachievers. Even if they aren't the most popular girls in school, they aren't too worried. They know their real lives will begin once they get to their Ivy League colleges. There will be ivy, and there will be cute guys in the libraries (hopefully with English accents)! But when an unexpected event shows them they're missing out on the full high school experience, it's time to come out of the honors lounge and into the spotlight. They make a pact: They will each take on their greatest challenge--and they will totally rock it. Gigi decides to run for student rep, but she'll have to get over her fear of public speaking--and go head-to-head with gorgeous California Will. Bea used to be one of the best skiers around, until she was derailed. It could be time for her to take the plunge again. And Neerja loves the drama club but has always stayed behind the scenes--until now. These friends are determined to show the world that smart girls really can get what they want--but that could mean getting way more attention than they ever bargained for. . . This tale of friendship, relationships and redefining yourself without losing your true self is a sure fire hit. Gigi, Bea and Neerja have always idolized Neerja’s older sister. She was at the top of her high school class and got accepted into an Ivy League college—everything the girls are striving for themselves. When they discovered Neerja’s secret, they realized that maybe being at the top academically when having to sacrifice everything for it, is not all that they thought. They make a bargain with each other to try new things during their sophomore year. Bea and Gigi end up joining the ski team; Neerja the school play and Gigi runs for student representative on the city council. While breaking out of their shells, the four of them learn that being smart is one thing but standing up for themselves, what they believe in and that they need to give others a chance are equally as important to staying at the top of their class. This is such an amusing and lighthearted read filled with laugh-out-loud moments, light romance and positive role models. I enjoyed the well developed characters, especially the growth that we can see in Gigi. She does not have it all figured out by the end of the book but she definitely has learned not to judge others which is an important lesson for us all to remember. I enjoy Ms. Strohmeyer’s writing style—it is witty, well paced and engaging. I look forward to reading her second young adult contemporary novel--How Zoe Made Her Dreams (Mostly) Come True, which came out in April. To me, her first novel had everything I hoped it would have in this type of contemporary fiction and I hope I will find the same in the next one.